You are currently browsing the Bookmobile News weblog archives for May, 2012. It’s here – our biggest children’s book drive of the year, coordinated by United Way of the Wine Country, Exchange Bank, and JDSU! Please help us break last year’s record of 5,000 kids’ books donated to the Free Bookmobile…and help insure that no matter what their families’ income or where they live, children all over Sonoma County will have great books to read this summer. Help us keep them motivated to learn! In fact we depend on these donations not only for summer outreach but to supply our patron families with quality material all year long. During the two weeks between June 7 and 21, please bring as many books as possible to any Sonoma County Exchange Bank location. And tell your friends and neighbors! Click here to see more information available on the official drive webpage, including examples of the kinds of books we’re especially looking for. In short, our need is for all ages, from toddler through teen/young adult, and in both English and Spanish. Thank you for taking the time to support the children in your community! We have four donation drop-off locations active at the moment, which can be viewed by clicking here or visiting our website. We are in the process of recruiting additional sites, particularly for donors on the east side of Santa Rosa and in the Sonoma Valley. Thank you for your continued support as we seek to provide the highest quality material to our thousands of patrons! 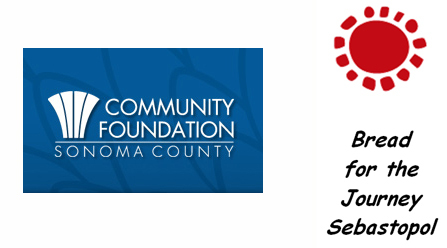 Community Foundation Sonoma County and Bread for the Journey Sebastopol are two of our most important partners. After having the pleasure of working with a number of their officers I can tell you they both exemplify the kind of positive spirit that helps small non-profits like the Free Bookmobile thrive. A little history: the very first funding the Free Bookmobile received towards purchase of our fabulous vehicle came from Bread for the Journey Sebastopol (BFJ). BFJ board members Sharon Bard and Toni Winter met with bookmobile director Glen Weaver very early in the process and reassured him he was on the right track! Their support has continued to be fundamental to the Free Bookmobile’s success, and in fact Sharon now sits on the Literary Arts Guild board as well. Last week she boosted our cause yet again, working with Community Foundation Director of Philanthropic Services Miguel Ruelas to co-host an important donor-awareness event. This lovely afternoon gathering was a big step in getting the word out to folks who support literacy in Sonoma County, and resulted in a crucial matching grant opportunity for the Free Bookmobile as well. Huge thanks to co-hosts Sharon, Miguel, and Julia L. Grant! 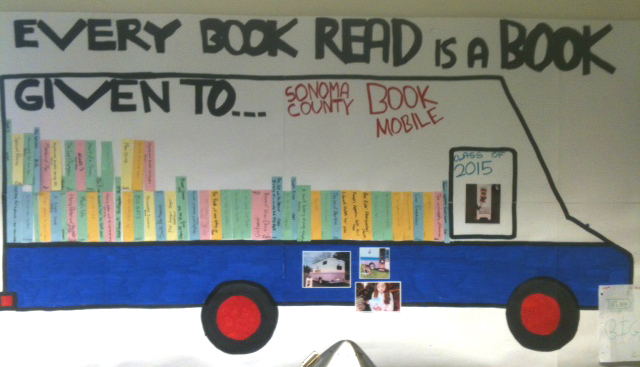 5th grade Sonoma Country DaySchool teacher Ben Bacon has been a good friend to the Free Bookmobile. Last year he hosted a neighborhood book drive for us at his home, and this March he helped his class combine their love for reading with their love for service. Every book read by his students would later be donated to us, up until May when we could come to the school and collect. Well it turns out they’ve been a bit more busy than that! Upon arrival this past Monday, we discovered Ben had rallied the entire school along the way in support of the Free Bookmobile cause. In a little ceremony, they just plain took our breath away by presenting us with a check for almost $2,500 worth of book-buying power! We’ve never been so excited to break open the Scholastic catalog.